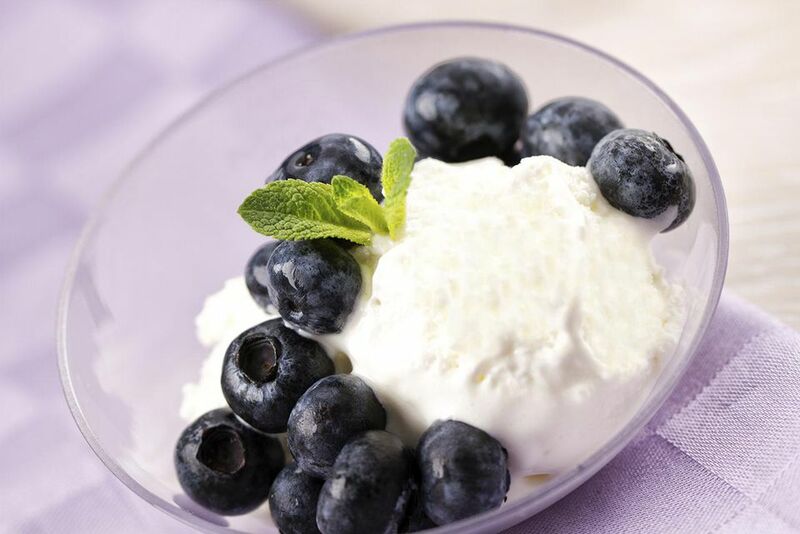 This recipe is a healthy alternative to ice cream or frozen yogurts prepared with dairy products, and it's easy to make. Prepared without any animal products, this dessert recipe is great for vegans, too. While you find non-dairy and vegan frozen yogurt more easily now in many stores, they may still contain additives or sweeteners you'd prefer to avoid. Making your own frozen yogurt allows you to control all of the ingredients. This recipe uses agave nectar, which is a liquid syrup similar to honey but that is lower on the glycemic index—meaning it should not raise your blood sugar as quickly as sugar or honey. If agave nectar is not available, feel free to substitute honey, maple syrup, or another liquid sweetener of your choice. If you haven't tried to make your own vegan ice cream because you don't have an ice cream freezer, this recipe shows you how to make it without one. All you need is a blender or food processor and a freezer compartment in your refrigerator. Combine soy yogurt, agave nectar, ground cashews, and vanilla extract in a blender or food processor and process until well combined. Add the xanthan gum and process for about 30 seconds to 1 minute more until smooth. Pour the mixture into a shallow metal pan and place in the freezer for 1 hour. Remove the pan from the freezer and return the slightly-frozen mixture into the blender. Process until smooth, pour the mixture back into the pan, and place the pan back into the freezer for 1-hour longer. Repeat. After the last blending (the mixture should be blended a total of three times), replace the pan into the freezer for 30 minutes to 1 hour before enjoying. Store the frozen yogurt covered in an airtight container in the freezer. You can grind the cashews yourself in your food processor if you can't find cashews already ground. Larger markets or natural food stores may have a dedicated cashew grinder in the bulk foods section, used to grind cashew butter. Or, you can substitute cashew butter. Xanthan gum is a natural stabilizing agent produced by fermentation by a bacteria. It is often used for gluten-free products as well as in commercially-produced ice cream. It helps prevent the formation of ice crystals and so it will help keep your frozen yogurt smooth rather than allowing it to become grainy. Most large supermarkets will have xanthan gum available in the baking aisle or the gluten-free section. Once you have made the vanilla version, you might try stirring in fruit puree or other flavors.